B.F. Skinner died in August 1990. He was praised as one of the most influential psychologists of this century, but was also attacked by a variety of opponents within and outside the field of psychology. Originally published in 1993, this introduction to his work is first of all a guide to a correct reading of his writings, a reading void of the distortions and misinterpretations often conveyed by … many commentators, including psychologists. 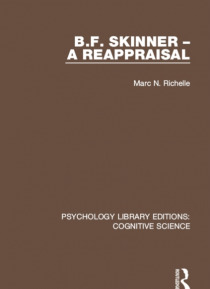 It frames Skinner's contributions with reference to major European traditions in psychological sciences, namely Pavlov, Freud, Lorenz and Piaget. Crucial aspects of Skinner's theory and methodological stands are discussed in the context of contemporary debates: special attention is devoted to the relation of psychology with biology and the neurosciences, to the cognitivist movement, to the status of language and to the explanation of novelty and creativity in human behaviour. Finally, Skinner's social and political philosophy is presented with an emphasis on the provocative aspects of an analysis of current social practices which fail to solve most of the urgent problems humankind is confronted with today. Both in science proper and in human affairs at large, Skinner's thought is shown to be, not behind, as is often claimed, but on the contrary ahead of the times, be it in his interactive view of linguistic communication, in his very modern use of the evolutionary analogy to explain the dynamics of behaviour, or in his vision of ecological constraints. Written by a European psychologist, the book departs from traditional presentations of Skinner's work in the frame of American psychology. It will provide the reader, who is unfamiliar with the great behaviourist's writings, a concise yet in-depth introduction to his work.